This week’s forecast is the first using our significantly revised methodology that most notably accounts for the big swing in Scotland from Labour to the SNP. The change is long overdue — sorry for the delay! The forecast GB vote shares for the Conservatives, Labour and Liberal Democrats are estimated using the old methodology, but thereafter we’ve moved to a simulation-based approach. Vote shares for England and Wales are simulated separately from those in Scotland. There are some adjustments for UKIP but this is still an interim methodology. Over the next few weeks we will make the model more flexible and capable of incorporating more sub-national data. So the health-warning now is that figures will change due to purely methodological changes. But better a move in the right direction now than waiting. Although the Tories are likely to secure the most votes (we give them a 71% chance of doing so), it’s still pretty much a tossup whether they or Labour will win the most seats. We now have the Tories as very, very slight favourites to be the largest party, with a 51% chance to Labour’s 49%. With the rise of the SNP factored in, the probability of a hung parliament has increased substantially to 79%. Thankfully the simulation approach now allows us to say something more informative about the relative chances of different kinds of hung parliament and which governments might form. There are a lot of political considerations in evaluating the chances of different government types that we discuss more fully here. The main things that you need to know to understand our graphic are that we are focusing on which groupings of parties could command a parliamentary majority and ignoring the question of whether the grouping would form a coalition (with cabinet ministers from more than one party) or do some kind of supply-and-confidence deal. There might be policy differences between, say a Lab-LD coalition and a Lab-LD pact, but it matters much more that it is these two parties controlling government and not some other combination. A Con+DUP+UKIP option is assigned zero chance because there is practically no chance, according to our model, that these parties would have more seats than Con+LD. A similar logic applies working anti-clockwise from the top. If Labour were just short of a majority we assume that they might appeal first to some of the smallest parties (SDLP, Plaid Cymru and Green). For bigger groupings with LD or SNP, we assume that the smaller left parties might be available in case they were needed even though in most cases they would not be required for a majority, hence the term Left instead of Labour. 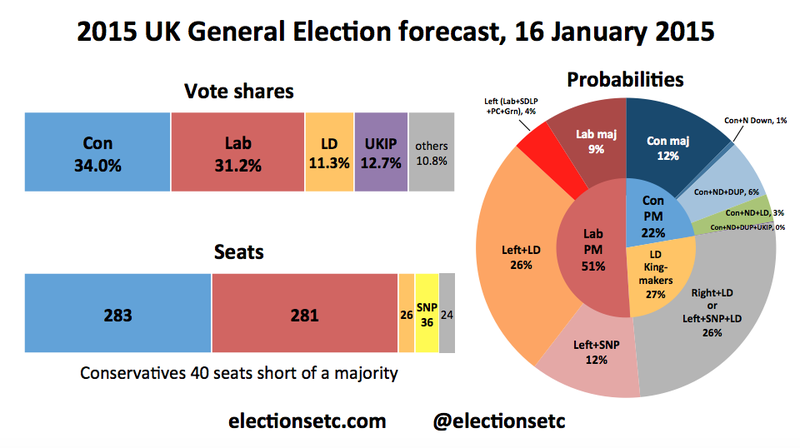 There is roughly a 1-in-4 chance that Labour could command a majority with either LD or SNP. Our graphic presumes that the Liberal Democrats would take precedence in this situation. Since the SNP are forecast more seats than LD, there is a 12% chance that Left+SNP have a majority but Left+LD do not. This gets us to the bottom of the circle, with thus far a 51% chance of a Labour-led government with Ed Miliband as Prime Minister. It also gets us to the grey area, both graphically and politically. Here the Liberal Democrats effectively look like kingmakers, with the power to chose between joining Labour and SNP on the left or the Tories and DUP (and maybe UKIP) on the right. The model also suggests a small chance the Liberal Democrats will get more seats than the SNP and then be kingmakers with a choice of a Left-LD grouping without the SNP. This is why the inner-LD Kingmakers section doesn’t quite align with the grey section for the groupings. Many would assume that the Liberal Democrats would be much more likely to go left if they found themselves in the grey area. In which case our model suggests Ed Miliband has a three-quarter chance of becoming Prime Minster after the election. If you think the Liberal Democrats might go either way, then the picture is more balanced. But Miliband would still have more chance moving into Number 10 than Cameron does of staying there – despite the Tories being favourites to win the most votes. There is even a 13% chance of a situation in which the Tories have the most votes and most seats while Labour+SNP+LD could form a government with a parliamentary majority. The explanation is partly bias in the electoral system: despite their forecast meltdown in Scotland, Labour are still expected to get more seats for their votes than the Tories. But more important is coalition potential. Labour’s potential coalition partners on the left look likely to get more seats than the Conservatives’ more natural allies on the right. Most importantly, the SNP is expected to be the third largest party in parliament. In our central forecast, they get 36 seats. A smaller but still significant issue is the effect of party competition at the constituency level. Liberal Democrat seats are much more often battles with the Tories than with Labour. So if the Tories do relatively well they are simultaneously likely to reduce the number of the Lib Dem MPs, and so their ability to form a majority commanding government. More details on our new methodology will be forthcoming. Fascinating look at the current state of play, which is becoming more Continental every time I check. This article almost seems more like it was written about a general election on “Borgen” than in the UK! Not to quibble with your conclusions–I know you said these probabilities are based on the math, not the personalities–but I’m not sure if I agree with the headline entirely. The left wing “bloc” may very well win more seats than the right wing, but doesn’t a Labour coalition–or even pact–with either the Lib Dems or the SNP seem more problematic than a grouping of right wing parties, given the toxic nature Nick Clegg’s reputation, particularly amongst the left, and the impracticality of the demands the SNP might be expected to make for either type of of arrangement (i.e. abandoning Trident or even another independence referendum)? If so, and I say this as a die hard Labour supporter, I think five more years of Mr. Cameron might be the slight favorite. WELL DONE!!! This is more like it. I would not be surprised if Labour support fell away dramatically in the last week or two before the general election, as in 1970 and 1992. I just feel that Ed Miliband’s poor personal ratings will be a major factor in the final days, as was the ‘Kinnock effect’ in 1992. Although we do not have the US Presidential system, it is clear that our general elections are still very much about electing a Prime Minister, and I do not believe that current opinion polls adequately measure what will be the reluctance of voters to elect Mr M in the spring! Still, this is shaping up to be the most interesting election since 1974, and (as in 1974) there is a good chance of another election a few months down the line. It looks like a unholy alliance witch ever way you look at it with another election within 6 months .And i bet they wallop the duty on petrol as soon as. Lady Hermon left the UUP because of their link-up with the Tories. She’s (Blairite) Labour, she not going to support Cameron.